The business leadership organization Identity Clark County has appointed Mike Nieto of Catworks Construction to its Board of Directors. Nieto is President of Catworks Construction of Battle Ground, Wash., a full-service construction general contractor with civil, facilities, trucking and environmental divisions. The minority-owned business was formed in 2005 and employs nearly 40 who work across the western United States. 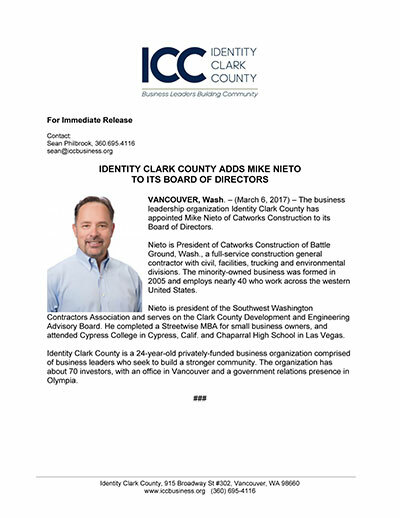 Nieto is president of the Southwest Washington Contractors Association and serves on the Clark County Development and Engineering Advisory Board. He completed a Streetwise MBA for small business owners, and attended Cypress College in Cypress, Calif. and Chaparral High School in Las Vegas. Identity Clark County is a 24-year-old privately-funded business organization comprised of business leaders who seek to build a stronger community. The organization has about 70 investors, with an office in Vancouver and a government relations presence in Olympia.